16/3/08 — Acquisitions — Paris, Musée du Louvre — We have followed the acquisitions of the Department of Sculptures at the Musée du Louvre quite regularly (see the list of articles below). The following are the most recent and concerns those we have not yet mentioned. 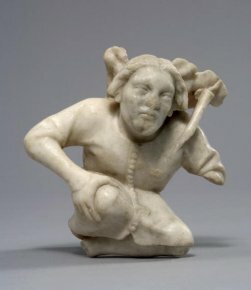 Acquisitions policy which focuses on major pieces in French sculpture, also tries to cover missing artists in foreign schools. — Ascribed to Jean de Liège, Man Stooping, circa 1376 (ill. 1 ; purchased in 2007). 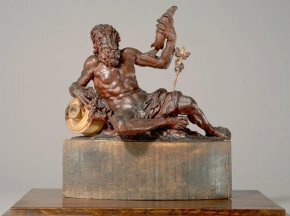 The most important figure, along with André Beauneveu, of Parisian sculpture artists in the second half of the XIVth century, Jean de Liège is difficult to grasp because his work has often been destroyed and also due to the many people employed in his workshop. Many fragments belonging to larger monuments, often funerary ones, are only “attributed” to him. The authorship of this small anthropomorphic console is therefore based on on stylistic criteria. The figure’s traits, with the mouth’s pinched lips and the outline of the eyes without pupils, recall those of other acknowledged works by the artist, such as the from the Musée Gulbenkian in Lisbon. — Swabia, circle of Niklaus Weckmann, Saint Catherine (ill. 2 ; purchased in 2007). In 2005, the Louvre had acquired two wooden bas-reliefs representing The martyrdom of Saint Barbara and that of Saint Catherine, from southern Swabia and dated 1520. 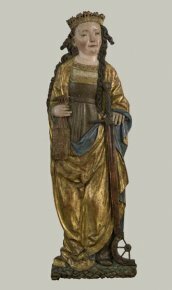 This is a Saint Catherine, from the same school and a close date, which entered the museum in 2007, from a private collection. In this case, the relief depicts the saint by herself. The colors are mostly original. — Tyrol, early XVIth century, Saint Sebastian (ill. 3 ; purchased in 2006). This figure is from a retable. The saint is seen with a beard as is usually found in Germany at this time, unlike traditional iconography . — Hubert Gerhard, A River Figure (ill. 4 ; purchased in 2006). This is a model for a sculpture for the Wittelsback Fountain in Munich. The Louvre did not have any works by this Mannerist sculptor up to now. Gerhard was born in the Netherlands but spent his life in Bavaria. This is the only known wax study by the artist. 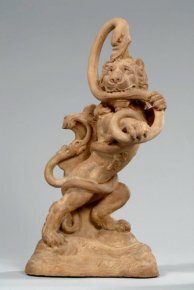 — Walter Pompe, Fight Between a Lion and a Lintworm (ill. 5 ; purchased in 2007 from the Patrice Bellanger Gallery, Paris). The subject has been identified from a Flemish inscription written in the form of a riddle. A combat between a lion and a lintworm the size of a boa constrictor is not very common. It might refer to a pun related to the patron’s name. The work, acquired in 2007, will be published by Guilhem Scherf. 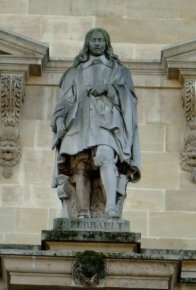 The Louvre already owns a terra-cotta work representing Saint Sebastian and a fragment of a Crucified Christ by Walter Pompe, a major sculptor in XVIIIth century Antwerp. 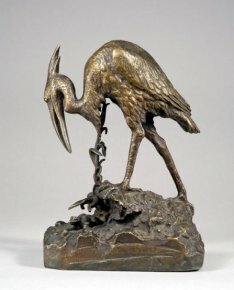 — Central Europe, mid-XVIIIth century, Allegory for the City of Prague (ill. 6 ; purchased in 2007 from the Patrice Bellanger Gallery). The subject can be identified thanks to the city’s arms on the shield. This might be a project for a monument celebrating the crowning of the Empress Maria Theresa in Prague in 1743. — Auguste Hyacinthe De Bay, Claude Perrault (ill. 7 ; purchased in 2007 from the Jacques Fischer Gallery). This plaster mock-up for a statue on one of the Louvre’s façades (ill. 8) represents the architect of the colonnade, Claude Perrault. De Bay was a painter and sculptor and was awarded the Prix de Rome for the second discipline in 1823. 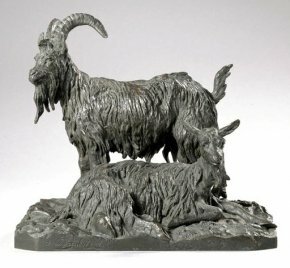 — Three animal bronzes joined the collections at the Louvre due to a cession from the Domaines (meaning it was confiscated by customs). 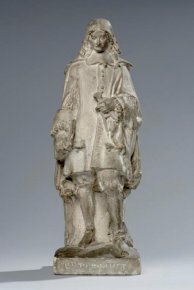 Two of these statuettes are by Christophe Fratin (ill. 9 and 10), the third by Auguste Lechesne (ill. 11), a sculptor from Caen who, like De Bay, worked on the Louvre. He should not be mistaken with his son, who was also a sculptor named Auguste and died prematurely in 1861. 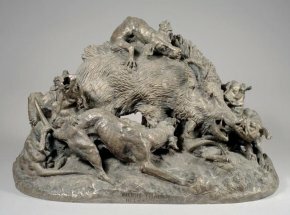 This Boar Attacked by a Pack is strongly influenced by Barye’s art. — Finally, we publish here (ill. 12) the photograph of an acquisition we had already mentioned two years ago. 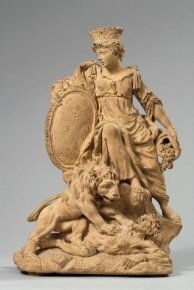 This is a model, by Gilles Guérin, for a statue of Louis XIV installed in the Place de l’Hôtel de Ville in 1653 (see news item of 7/1/06 in La Tribune de l’Art in French) which was replaced in 1689 with the one done by Coysevox (see news item of 7/12/07). See Sophie Guillot de Suduiraut in the Revue des Musées de France to appear in April 2008.